A preorder of Dead Island with Amazon will land buyers a digital art book filled with "game art and concept art of everything from the characters, that fat tourist dude with the camera, zombie types, environment concepts" and more, Deep Silver says. It moved two concept pieces with a news release on the bonus, written in trademark bizarre tone. 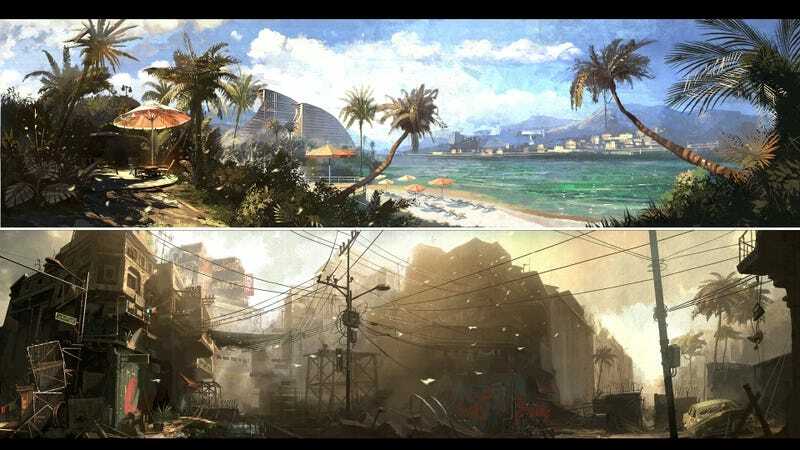 Deep Silver's Aubrey Norris writes of her experiences with the playthrough, warning that players will have to toughen up when leave the resort area (above, top) and move into the city (bottom). Ram and Thug class zombies supply a more physical challenge but can be handled with burning weapons. Dead Island arrives Sept. 6 for the Xbox 360, PS3 and PC.